Want to fly like a bird or almost? Share the sky with the birds! Explore fantastic views of Nepal from above! 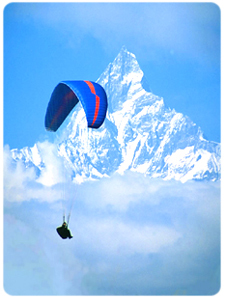 The main paragliding site of Nepal is the Pokhara valley with constant and friendly conditions for paragliding experience due to its special microclimate. The valley provides views of Annapurna Himal, including 3 of the world's 8000m peaks. Paragliding in Nepal Himalayas is a lifetime experience for the adventure-lovers as it rewards you with some of the best scenery on earth. Taking a tandem flight is the easiest way to have a go at paragliding. Tandem flying involves an experienced pilot flying with a passenger (i.e. you!). Both the pilot and passenger have separate harnesses that are attached to each other and the wing. Paragliding harnesses are built for comfort and safety, they feel more like an armchair. Once launched the passenger just sits back, relaxes and takes in the epic scenery. Even taking pictures is not a problem. 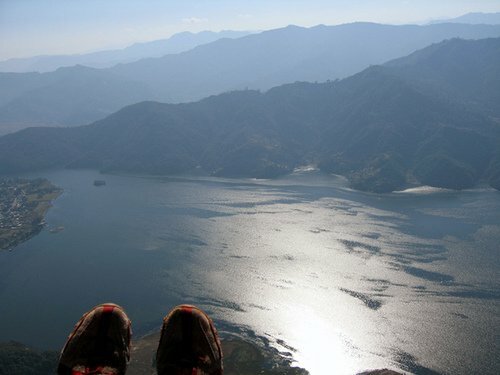 Phewa Tal View: In the morning and late afternoon these 15min flights give you a taste of unpowered flight, taking you over Pokhara lake and then landing by a Lakeside bar. Cloud buster: This midday flight gives you the thrill of high flight as we thermal up above Sarangkot in the company of eagles and vultures, 30min - 1 hour. We land by the lake. Cross-country: This offers you the chance to experience flying from one valley to another. Using thermals, clouds and birds to guide us, we take you on an unforgettable journey north of Pokhara towards the big mountains. We fly as long as we can and aim to return to Pokhara that afternoon. Gliding is a weather dependent sports and the flying season in Nepal commences from November through February, the best months being November and December. For those more serious about getting into paragliding there are full courses to get you flying solo in no time (typically 7-12 days). Expert instruction is delivered via 2 way radios. Due to the exceptional weather during the season in Nepal, you can complete the tasks needed to gain your license far quicker than in less predictable climates. If you are interested in paragliding and you would like me to obtain quote(s) for you from reputable operator(s), then please email me here with any dates you had in mind.